A very long time ago, I developed a game system designed by Brian Knipple. It used special chits to portray the chaos of jungle warfare, coupled with a very smooth-playing, more or less traditional wargame engine with a pretty intuitive combat results table that inflicted results on both attacker and defender. I liked the system very much. 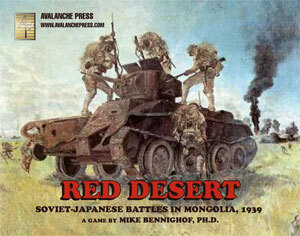 Brian designed a couple of games for Avalanche Press using the system: MacArthur’s Return and Tiger of Malaya. I borrowed it for a couple more: Blood on the Snow and a game called Winter Fury, both set during the Winter War between Finland and the Soviet Union. We never marketed those as a game series, but even so they all sold out and we went for some years with no games in the system in print. Now it’s time to fix those oversights. First off, 22 years after the publication of its first game, the series finally has a name: Command and Control. And some years after the last of them (Tiger of Malaya) went out of print, they’re making their return with the release of Winter Fury. Winter Fury is a good place to re-start this game series. It’s a small game, with 220 pieces (not all are used at once; it has both 1939 and 1941 scenarios for battles fought over the same ground but with different formations). There’s a 22x28-inch map, and a full-color player aid card. All of that comes within a 64-page book with rules, scenarios and background. It’s a new edition of the game we brought out at the turn of the century; the next-to-last in this series to appear from Avalanche Press. It’s good to have the series back. The name Command and Control pretty accurately reflects the games’ underlying design concept: you might have plenty of units, but you can’t always use all of them as you’d like. One side usually has an advantage in this area; the game system’s at its best when it shows the clash of asymmetric forces, particularly when each has a different advantage. The games show this through a clever but pretty simple chit-pull mechanism. Each side has a set of “chits,” game pieces describing an action: Full, Move, Attack and similar notations. They go into a common container, and then are drawn out randomly. Sometimes, as with Winter Fury’s Soviets, the chits activate units of just one formation (usually a division) and in other games (or in the case of Winter Fury’s Finns) they activate all the units on one side. The number of chits put in the container can vary based on weather and each side’s supply situation. They player also gets some limited choice in what chits are included. This creates a fair amount of battlefield fog of war, and also allows for turns to be of variable length: in some turns, more chits will be in the container, which means more units will get to do stuff. In others, things might end rather quickly. Command and Control won’t have a true series rulebook, though that was a serious consideration. I like having a series rulebook for a number of reasons. As a publisher, it cuts down on the number of different parts to coordinate. Print a standard rulebook with standard play-aids, and the number of new items is greatly reduced. As a designer, the presence of a series rulebook forces you to work within the system: to study and discover how things actually worked during the campaign rather than just write a new rule to cover every seemingly isolated event. If your underlying model is solid, then the events aren’t as isolated as they may seem at first glance. If you have to work with a series rulebook – provided, of course, that it’s a well-designed and historically-valid series rulebook – then you’re forced to find that answer rather than just wave your hand and be done with it. I like this aspect very much. And finally, we want these games to be played. I’m well aware that many wargamers are perfectly happy just “having” the games – I hear from plenty who wish we’d quickly grind out more games regardless of whether they’re ready for play or not. I want players to be able to learn to play one game, and learn it fairly quickly, and then immediately be ready to play many other similar games, too. Life is too short, and leisure time too precious, to spend it sussing out game rules that may or may not actually work. If you find a game system you like enough to play more than once and in more than one setting, then doing so should be easy. This stuff is supposed to be fun, and we sell fun. Winter Fury is what we call a Playbook: a paperback book that comes together with the game’s map and pieces and a (full-color!) player aid card. So including rules for jungles and deserts would have been pretty silly and confusing. Each Command and Control game will have its own rulebook, but most of the text will be identical from one to the next, and we’ll highlight the differences to help players get moving as quickly as possible. Command and Control games have a constant unit scale: battalions for the most part, with some specialist companies like tanks and engineers. The units could, in theory, be transposed from one game in the series to another, but these are not true “toy box” games like Panzer Grenadier or Infantry Attacks: the maps and the set of pieces are specific to the battlefield where the actual fighting took place. 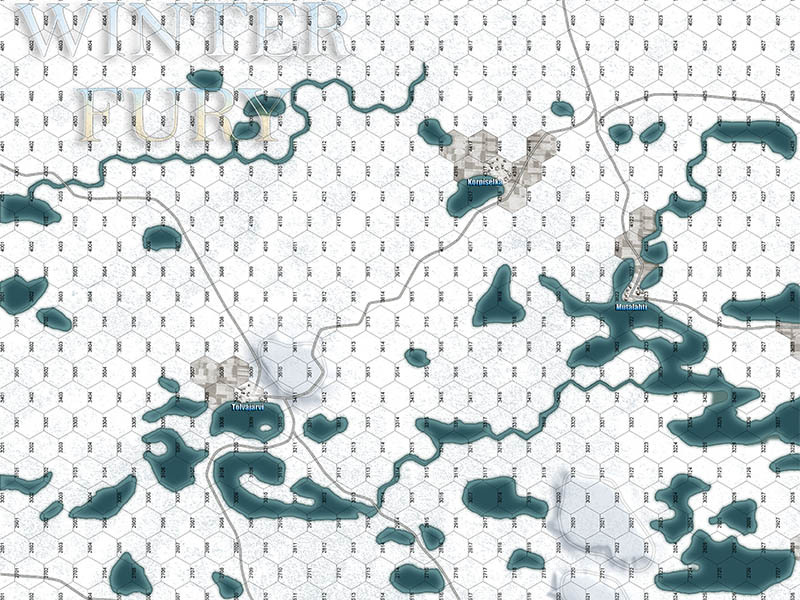 The map is a standard wargame hex-grid affair; the ground scale is usually two kilometers per hexagon. Unlike Panzer Grenadier, Command and Control was never intended as a universal World War II system that could simulate any battle at the proper scale. It works best for struggles between unequal opponents, where each has special advantages (mountaineering skills, raw numbers and firepower) and the terrain and/or the weather is rough and unforgiving. It’s not well-suited for the massive tank battles that wargamers love the best; we have another system, and another revival/re-branding, for that. Click here to order Winter Fury right now.